I have this netbook for traveling and use on the go, and my battery has stopped working. When I try to push start with direct charging so it will show me an error code 0xc0000185. I don't know what should I do, Can you suggest me anything about it. AnonD-77889, 25 May 2013Cant go by nowadays without a PC/Laptop/notebook nor a Tablet/Smartphone You either have... moreI don't a "smart"phone and have gotten by no problem... hard to look at websites and text in general on a 4'7 inch screen. i choose laptop rather than smartphone. if my budget is 30k will choose 25k for laptop and smartphone 5k. I still like my desktop which is really heavy duty stuff.You need the train, You need the car, you need the cycle/scooter. All have their place. am sorry as i was reading this i saw that there was alot of favouring towards the smartphones..
smartphones and laptops are meant to work hand in hand..to interlink they are meant to be in sync not competing against eachother..
i can personally live without a smartphones but not my laptop. computer has its own usage as usual mobile has its own ..
computer can use for play high defination game , prolong use ect ..
while mobile is portable , can use for calling to other no & limited service . now a days usage of smart phone usage increase , but importance of computer not yet vanish ..
jj, 23 May 2013noticed you need PC or Laptops to download games/updates/softwares for any Smartphone? LOL ... moreYou don't anymore. Ever heard of OTA updates? Don't get me wrong , but its 5.40 AM here and I find it tough to stay awake. Eye strain & not your work GSMArena. Hi. This seems to be a really interesting piece. I say 'seems to be' because I haven't finished reading it. I had seen this coming around late 2009 / early 2010. Ever since we saw the first 1 GHz smartphones , I knew that the race for GHz would begin all over again probably followed by multi cores - a scenario similar to how Intel evolved over mere clock speed wars to bring in more performance per watt per sq. unit of area. Back in 2010 it was like...what ?? A 4" touchscreen phone ?? 3" was huge in itself. In 2007 the term "big" then meant 2.4" at least (PS - not you , iPhone owners. Android had just started in 2008 ; I still have an x86 Live CD). And look where we are now. 4" ?? Huh , that's tiny. As you've rightly pointed out , a dedicated app store for smartphones only fueled the innovation further. Frankly speaking , the comparison was unfair. Just look at the difference in screen sizes. 13.3" to 5". More than two times. Hell even a double-folded S4 feels small. Right now it would seem ridiculous to conclude that mobile phones will replace laptops. For the reasons of comfort & practicality. For example , lets ask people to edit a spreadsheet on S4. See where I'm getting at ?? So for now , its just too early to give a verdict. At this point a smartphone is something more than a device that just calls and texts. It hums songs for you , captures amazing pictures and records breath-taking footage - all the while keeping you connected to the web too , among other things. It won't exactly be a revolution. Its an evolution. The mobile phone will first have to take over the netbooks/tablets/ultrabooks/hybrids/convertibles­. While comparing with an ultrabook was a good first step , it would be interesting to see how a smartphone compares with a mainstream laptop (dedicated graphics for games , more powerful 2GHz+ multi core CPUs , bit more of RAM and at least 10 times storage space). As far as I'm concerned , the point of time when smartphones will take over mainstream laptops will be as exciting as its anxious. As in , will the energy efficiency of smartphones still hold against their sheer number crunching abilities ?? At the horizon of things , I see a possibility of having one OS (Android) across a myriad number of device categories. What does that mean ?? No more app porting. What works here , works there as well. No burden of learning different languages & how to code apps on different platforms. Things will unify and converge to make life simpler for all of us. (Seems no less than wizardry , but) if Samsung gets any success with its foldable screens , then we might get one devices that can be folded to a mobile phone form factor when we want to call someone. When you want to use it to check mail , browse pictures or play movies , just unfold it to a bigger screen size. If you want to type , just unfold & dock it to a new keyboard. Fascinating... !! But as I imagine more I begin to have more doubts. 1. If devices do come with foldable screens , where would the battery go ?? They are making these things thinner , but not smaller. 2. Where would you place your ports (HDMI , microUSB , 3.5 mm jack)on this thing ?? Or will wireless communication (DLNA , bluetooth headphones) have truly taken over and buried the cables underneath ?? This is totally pointless article. What is the point beside stating the obvious that different devices have different use cases. Yes the phones can replace the laptops for some basic tasks, but for all and they never will. The screen is not only ppi, but also size. You can not be productive on 5" screen without multitasking. Also I don't see how the sales figures are any indicators for one of devices getting the other one "killed". Simply the laptops have been powerful enough for the average user and they do not buy new laptops so often as before. As for the smartphones they are still evolving and you can still get bit leaps in performance between generation. Not to mention the fact that the design life of a smartphone is an year and not more. Its either one out of these 4 options or none at all. Either way you slice it, EVERY worker/student(or both) has(or uses) one or two portable devices AND AT LEAST ONE device that is(or is close to) a PC(laptop/notebook/chromebook) which they do not move around with often. My personal preference is my phablet(note) which does in fact function close enough to a tablet despite what few may think, my laptop(desktop replacement) and my actual desktop. What do all three of these equipments have in common? They're all high in storage capacity, media output and computing power but lack portability. That's my trade off but I like what it gets me. noticed you need PC or Laptops to download games/updates/softwares for any Smartphone? LOL how you compare laptop displays / GAME MONSTERS / with piece of junk like samsung galaxy s4 which is a Truly one? Smartphone never replace in 100% real laptop pc . 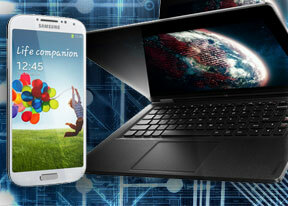 Comparing the processing power of smartphones and laptops misses the point. Compared to laptops and desktops, smartphones and tablets are just toys. The simple fact is that laptops and desktops will always be used for work. Smartphones and tablets are useful but as long as people work in offices it will be laptops and desktops all the way. AnonD-90736, 21 May 2013Omg some of you desktop stalwarts are really getting desperate. Dont fight change, change alwa... moreYou also need to see intel with their haswell and broadwell as well. Next gen Maxwell from nvidia, richland APUs from AMD and the next gen of their GPU.